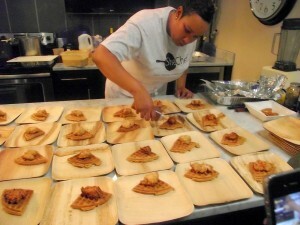 Meet Elle Simone of SheChef, our 5th Annual Public Art Potluck chef! Tickets to the Potluck are available here. We’re really excited to be working with Chef Elle this year—her food is incredibly delicious, and in our brand-new venue this year, we’ll be able to accommodate more guests than ever before. So come one, come all—and don’t forget to bring your ideas! How would you describe your cuisine in three words? Many people have used terms to describe my food but I would say that it is: intentional, organic and traditional. When and how did you first discover your love for food and culinary arts? I spent a lot of quality time in the kitchen with my Granny as a child. Cooking became a communal ritual between her, her mother, and sisters. I was a very inquisitive child so in order to deflect all the questions I’d have about what she was doing, she’d show me and tell—not only to teach me but to keep me distracted from questions, I think! 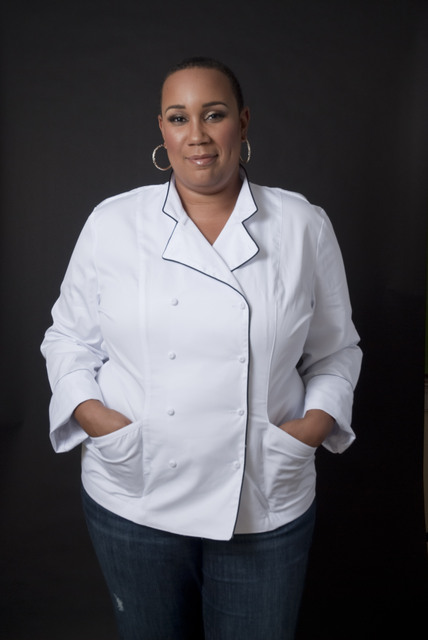 In addition to working as a chef, a culinary producer, and food writer, you also run a mentoring program for young women. Can you tell us more? I think above all the work titles I have, I am most proud of being an activist and advocate for change as it relates to Women’s Rights, Child Abuse/ Sexual Assault issues, and Health Advocacy. I was a Social Worker for several years before becoming a chef so that part of me is always very alive and active. What’s next for your LLC, SheChef? SheChef is branching out to be a resource for women entrepreneurs. We are hosting our Inaugural Women Mean Business Conference. It’s a small business development conference with workshops and panel discussions for women who are looking to start a business and don’t know where to start and also as edification for those who are established and want to up the ante a bit. That’s on November 15th and its website is http://goo.gl/KY3ngN. What’s your neighborhood, and what do you love most about it? I live in the Bedford-Stuyvesant area of Brooklyn. I love that my immediate community is very active in the beautification of the neighborhood. We all look out for each other and have respect for each other. Cool! What’s your favorite film, book, or song about NYC? What excites you most about working with The LP for our 5th Annual Public Art Potluck? I LOVE The LP mission of providing understanding and creative space for artists. I feel that there are some arts and artists that are less traditional who need a voice, kind of like culinary arts. Also, I love cooking fall-themed menus and feel very excited about providing that for everyone. We’re excited as well! Without spoiling any surprises, can you tell us about the inspiration behind the menu you’re planning? Growing up in Detroit, I was exposed the cuisines of the dominant cultures there, Greek & Arabic! My menu represents that a bit and ALSO the kinds of comfort / communal meals that I grew up enjoying during the fall season. And what dish are you most excited to present at the Potluck? I’m most excited about the Greek Moussaka! Visit Chef Elle on the web at shechef.org. Don’t forget to buy your tickets to our Public Art Potluck! previous post: Our Artists Are Everywhere!